Part of my John Masters Organics shopping haul is this leave-in hair product called â€œShine On Hair Treatmentâ€. It is supposed to give what its name impliesâ€”shineâ€”definitely something I need because my hair has absolutely zero shine due to the frequent dye jobs I’ve done. To be honest, the state of my hair has never bothered me in the past till now. Iâ€™ve grown a lot more concerned about how I look and I think having shiny straight hair definitely lends me more credibility at work. 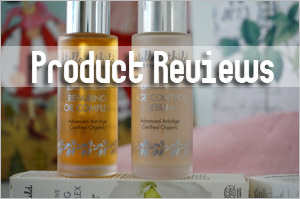 Before I go on with this review, I have to state that I have never used any hair straightening products before. As a matter of fact, I donâ€™t think Iâ€™ve used ANY hair products before, apart from shampoo and conditioner! So while I canâ€™t compare this to non-organic hair products, I can definitely tell you the difference I felt in my hair before and after using it. 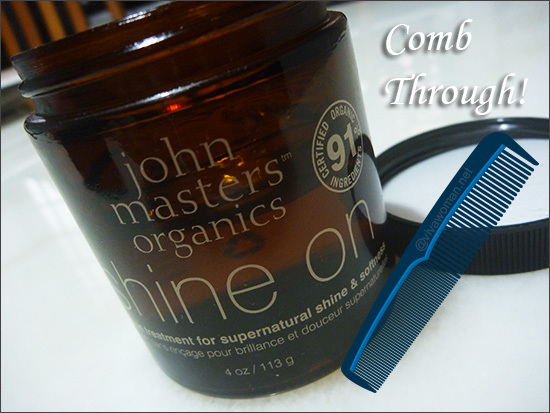 John Masters Organics Shine On Hair Treatment comes in jar of 113g. The packaging is very sturdy and design is minimally simple. The only thing is, in order to get the product out, you have to use your finger to scoop it out. Of course you can always use a spatula but to avoid the hassle, I usually just use my fingers. Since this product goes on my hair and not my face, I’m less particular about using my bare fingers to dig into the container. 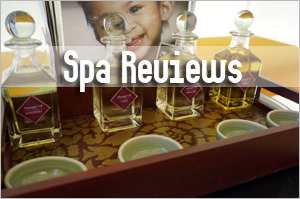 This treatment is a gel-like substance that is clear and colorless, and kind of looks like the old school hair gel. Surprisingly, there is no smell to this product at all. So how do I use this? Well, after stepping out of the shower and towel drying my hair, I will comb my hair first and then apply the product from the middle of my hair to the ends. 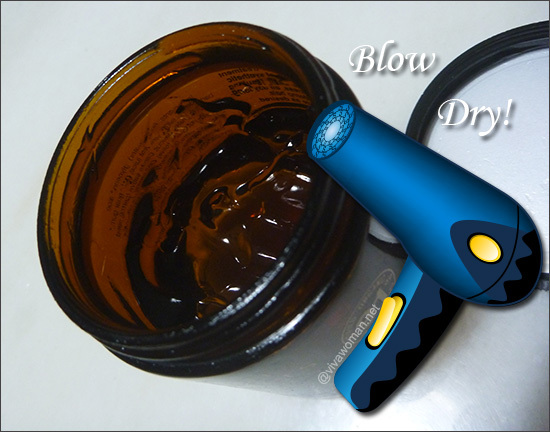 You can also apply the product on your hair before combing. Either way, the choice is yours. 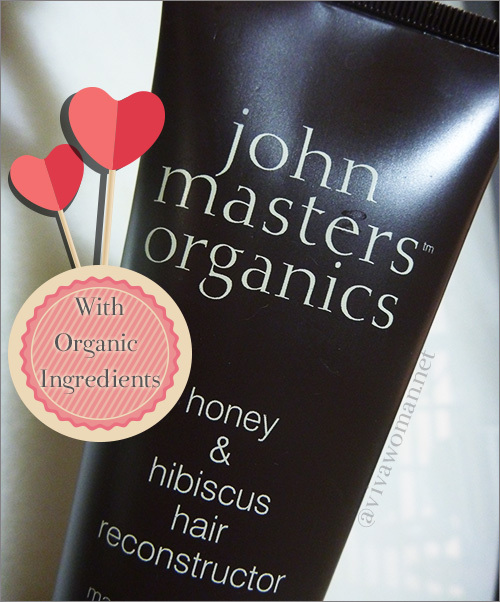 This product is similar to the John Masters Organics Honey & Hibiscus Hair Reconstructor I reviewed last week in that it doesnâ€™t leave a sticky after texture. It actually turns more and more watery and makes washing it off your hands a lot easier. If you shower in the mornings before heading out, there is another way to use this fantastic product. What I do is I comb and put it on my still slightly wet hair as usual, and then proceed to blow dry. I find that my hair ends get harder to dry when I use the product. I see it as a good thing because the gel prevents the heat from doing too much damage to my hair. 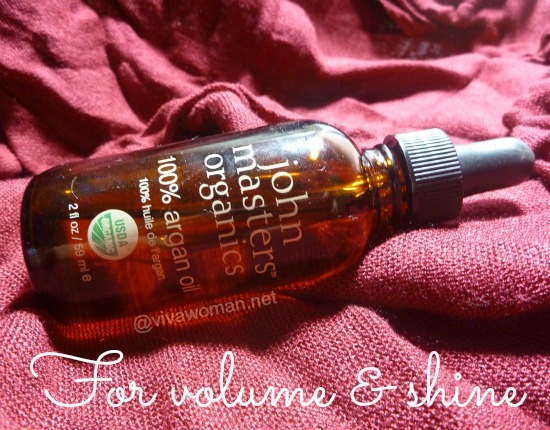 And the result after blowing dry with John Masters Organics Shine On Hair Treatment is always a thicker and more voluminous head of hair that looks shiny. 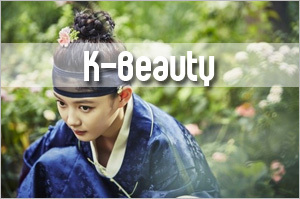 The difference is quite significant for me because even my husband commented about it and was envious! I been using the gel once every two to three days, sometimes more depending on whether I need to have a good hair day or not, and Iâ€™ve only just used up half the jar after a month. I bought it from Bud Cosmetics at Novena Square 2. 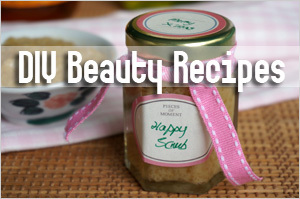 The 113g jar retails at S$56 and to me, it is worth every penny! Oooh… I tried this on Sephora (I used a flat iron on my hair that day) and applied this to the tips of my hair. I was afraid it might weigh my hair down so I skipped my roots. I actually loved it! I’ll probably be getting this once I’ve used up my Acure spray-on conditioner. 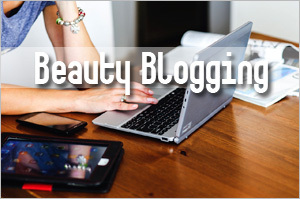 Eco Beauty last post is: Are you applying melted rubber on your face? Hmm, wow I love it!!! I have been looking for something natural, organic, and shine booster, and now I think I have found it! Thank you for this! 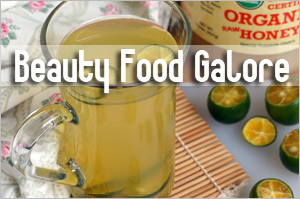 Like you, I too, am a big fan of natural, organic products, makeup, etc. I really appreciate this post and will look out for this and/or order on line! Hey Vivi, I was pleasantly surprised when I saw John Masters range in Sephora, although they don’t have the full range. I can imagine this product working great especially on straight hair! Hey Vanessa, glad this was helpful! This could possibly be one my favourite hair products and I’m keen on trying out the other products from this range. Hehe. When I was in 20’s, I always dye my hair. When I decided to go natural, I had a hard time making my hair smooth and shiny all the time. I’ve been using so many kinds of conditioners but still, my hair is not beautiful as before. I wish this hair shine treatment will be effective for me. I am willing to spend a fortune just to make my hair beautiful again. I am glad to catch an idea from your article. This looks absolutely perfect. 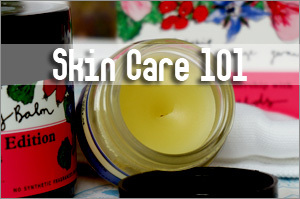 People always search for natural remedies for skin care and your information will be very helpful to all of us. Thanks for sharing this wonderful post. 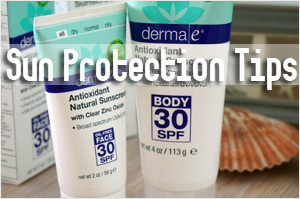 I take and suggest everyone to take care of their skin and face. Oh that looks really nice. 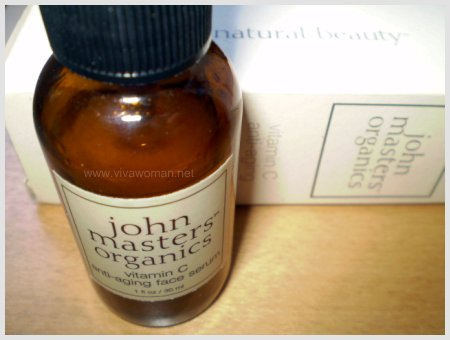 I haven’t used this one yet but love some of the other John Masters products. 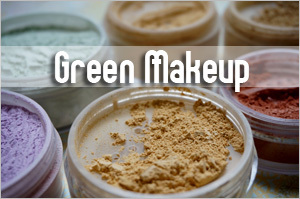 I just don’t like the idea much of using harsh chemicals on my face and head, yuk! 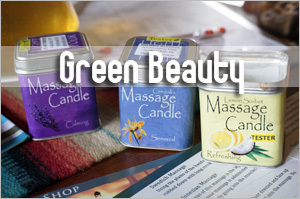 This sounds great – I’m always a fan of natural products. I’ll have to give it a tray. I also like the fact that it doesn’t feel sticky.